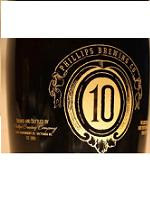 Ten years in the making, Phillips Brewing is celebrating this milestone with a special brew (of course!). "To celebrate 10 amazing years of crafting beer in Victoria, we are releasing a 3 Litre 10% Impreial IPA bomb! We decided to go all the way with a silkscreened label on champagne glass complete with a cork, presented in a whisky-style box. They are very limited edition so if you want one, be sure to grab it quick!! We’re selling these little pieces of Phillips’ history for $50. This Friday you can also come down to the brewery at 2010 Government Street in Victoria before 5, pick yours up, and put your name in a draw to win a Phillips’ 10 year prize pack including the 3 Litre monster! Happy Anniversary!! As always, thanks for supporting your local brewery."